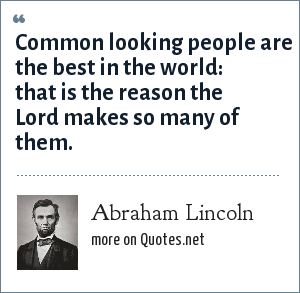 Abraham Lincoln: Common looking people are the best in the world: that is the reason the Lord makes so many of them. "Abraham Lincoln Quotes." Quotes.net. STANDS4 LLC, 2019. Web. 23 Apr. 2019. <https://www.quotes.net/quote/39879>.